Place the chicken in a bowl and add the beer. Let it marinate for at least 3 hours. Use a fork to combine the butter, salt, pepper, cumin and achiote in a bowl. Rub the butter mixture all over the chicken. Season the inside of the chicken with the garlic and lemon juice. Close the opening with toothpicks and tie the legs loosely together with some kitchen twine. Place the chicken on a baking sheet and cook for an hour and a half. To make the gravy: In a small pot over medium-low heat, place all the juices and grease released by the chicken while cooking. Add the chicken broth. Gradually incorporate the flour, constantly stirring with a wire whisk. Let the mixture come to a boil and reduce the heat to the lowest setting; keep it at a soft boil. Cook for about 5-8 minutes or until it thickens a bit. Season with pepper to taste. Serve with the chicken. You can marinate the chicken overnight to achieve a more delicious flavor. Erica Dinho I like chicken recipes because they're usually lifesavers when I haven't planned to cook anything during the week, and on special occasions for my guests. Chicken is very versatile and pretty inexpensive meat, which we can use to make delicious and different dishes by adding our favorite seasoning. 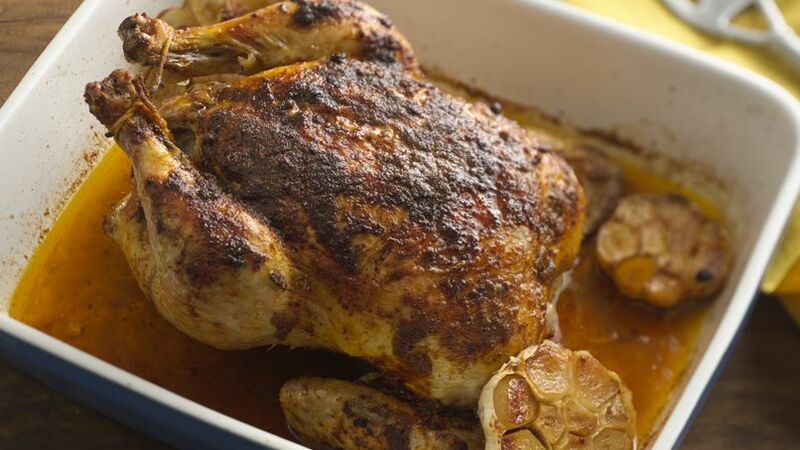 This roasted chicken with cumin and annatto recipe is delicious and very easy to make. The chicken turns out moist, but at the same time is crisp on the outside. And it gets a beautiful color from the annatto. Enjoy!